Welcome to my weird hippie over-the-top California veggie burger. What is a California burger? A quick Google search will tell you…a lot of different things. The only common thread I can decipher is avocado, and maybe bacon, if it’s a purist/historian talking. When I set out in search of the California burger formula, I was looking to confirm my idea of a burger with only the freshest toppings–lettuce, onion, tomato–and no cheese. Mayonnaise is usually thrown into the mix as well. And if you want to know the real reason I went with California style, other than my routine craving for a big juicy burger, it’s because I was craving mustard, and the rest of the Cali burger seemed to be a good fit with my favorite yellow condiment. 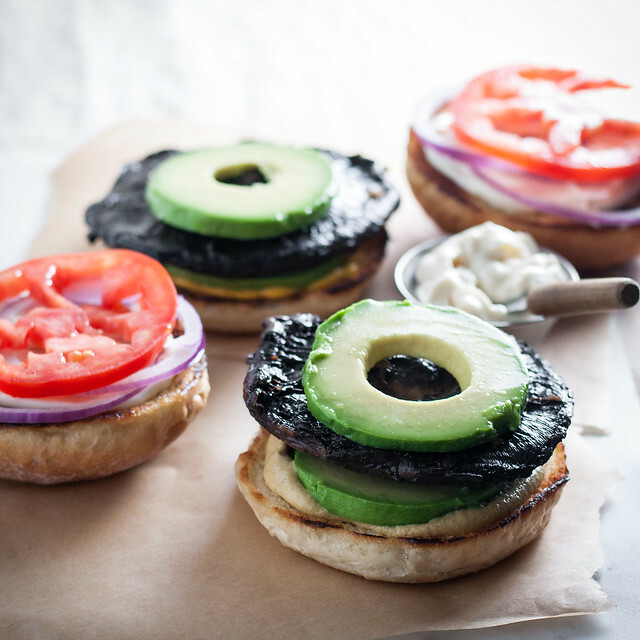 The way I see it, my marinated portobello burger is about as California as it gets: meatless, vegan (thank you, Just Mayo! ), marinated in wine, and, of course, loaded with avocado and crispy and juicy veggies. It’s light, bright, and fresh, while simultaneously being a total juicy, messy nuisance. This is the second burger recipe on NCK. If you’ve been reading a while, you might be familiar with my really confusing dietary strategy. Or maybe not so confusing, as it seems everyone is a part-time vegetarian these days. Basically, I’m not an official vegetarian, but it’s rare to find me eating meat and impossible to find me cooking with it. I’ve been meaning to write a post about all this for my about page, but most days the kitchen calls instead. Anyway, I don’t think I’ll ever touch ground meat again, and that’s a tough thing to admit coming from this burger QUEEN. Like, I love and adore burgers with all my might. When I see a beef burger on Instagram, I still drool over it. 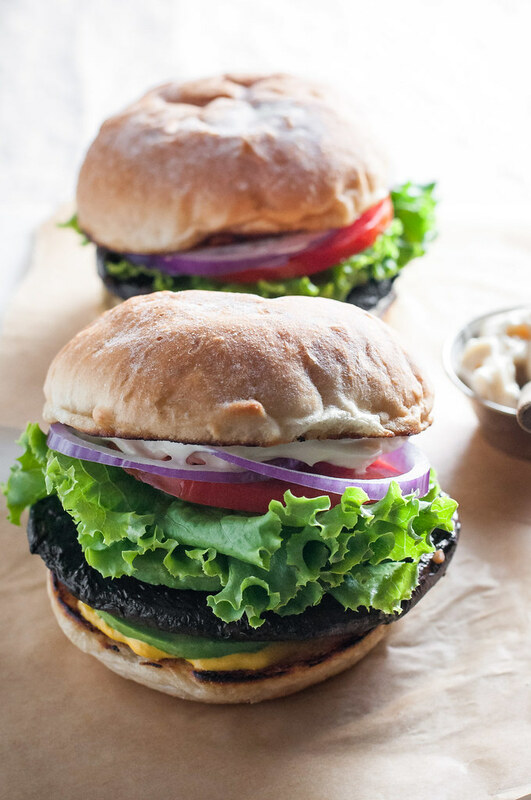 I rant frequently about the lack of good, quick, takeout veggie burgers in my area, but when the cravings become intolerable, I have a pattern of developing super juicy and satisfying meatless burger recipes. Maybe you’re thinking I’m cray, and no way could a friggin’ mushroom ever replace your beef patty. Butttt maybe you’re trying to be healthier, or you’ve been watching scary but accurate documentaries about the health and environmental consequences of the meat industry. In either case, you don’t have to go cold turkey. After all, I still won’t even declare myself a vegetarian. I just don’t like eating creatures, and when I have a burger that’s juicy like a beef patty, chewy like bacon, oozing with flavor, and made out of a fungus…then it’s a no brainer. I’m takin’ the ‘shroom. Besides the meatless factor, it dawned on me post-consumption that this burger is unbelievably vegan. If that word scares you, just pretend you didn’t hear me. However, I am in love (and not in any way affiliated yet, but would gladly accept a partnership) with Just Mayo vegan mayonnaise. Being from the midwest, the only mayo I knew for years was Miracle Whip, and it belonged in chip dip and pasta salad, NOT slathered on my burger bun, polluting the whole thing. Let’s just say my taste buds have matured, though, and aside from appreciating the creamy counterpoint that mayo is to mustard and to the tangy portobello marinade, I can be found taking a spoon and the jar of Just Mayo and going to hide in the corner on a bad day. Okay, there might be some of that wine involved, too. You can probably tell I’m over the moon about these ‘bello burgers (so catchy), but I completely forgot that Steve is still confined to a sling, and any type of finger food is pretty difficult for him. I felt like perhaps the most cruel soon-to-be-wife ever, serving him this untidy last meal before he hopped on a plane for the six hour flight to San Fran. I shouldn’t have worried, though. His determination (and extreme hunger?) got him through his burger well before I finished mine, without the need for Advil or an ice pack. The point of this blog is not to beg you to make my recipes, as hopefully the pictures speak for themselves, and you’re also into trying new things, but sometimes, if I could only show you how fast blog recipes, that are, in fact, real life recipes for me, disappear, you’d be much quicker to give them a try. Note to self: start video-ing dinnertime. 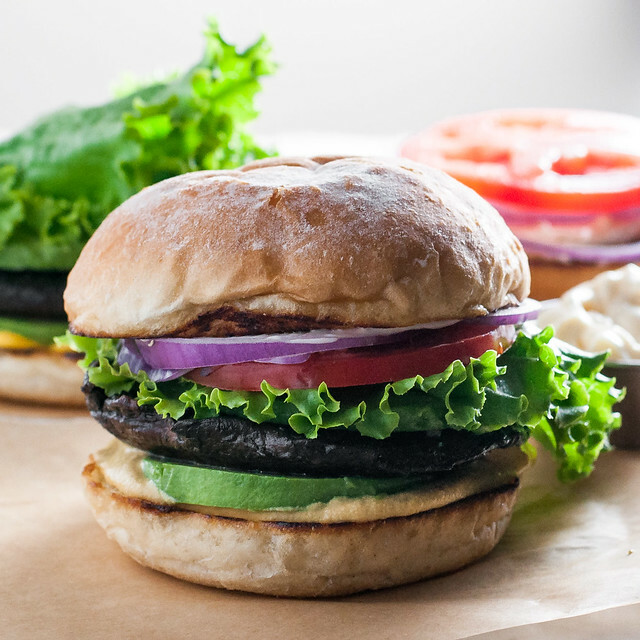 The true embodiment of a California burger, broiled portobello mushrooms are first tenderized in a wine marinade, then stacked with a slew of fresh, vegan toppings and condiments. 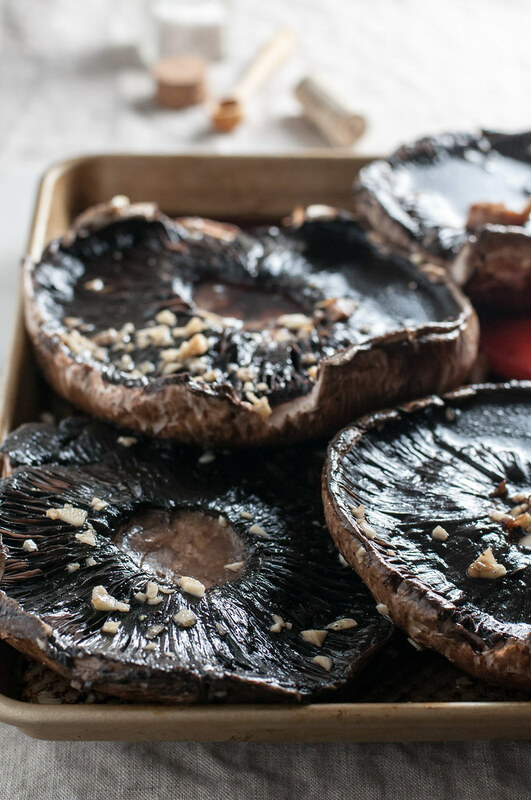 Place portobellos gills down on a rimmed baking sheet. Mix together all the remaining portobello ingredients to make the marinade. Brush over the tops of the mushrooms, then flip them over and pour remaining marinade over the gills. Let stand one half to one hour, brushing occasionally to make sure marinade is evenly distributed. With 5 or 10 minutes to go, flip caps and brush tops with more marinade, so it really soaks in. 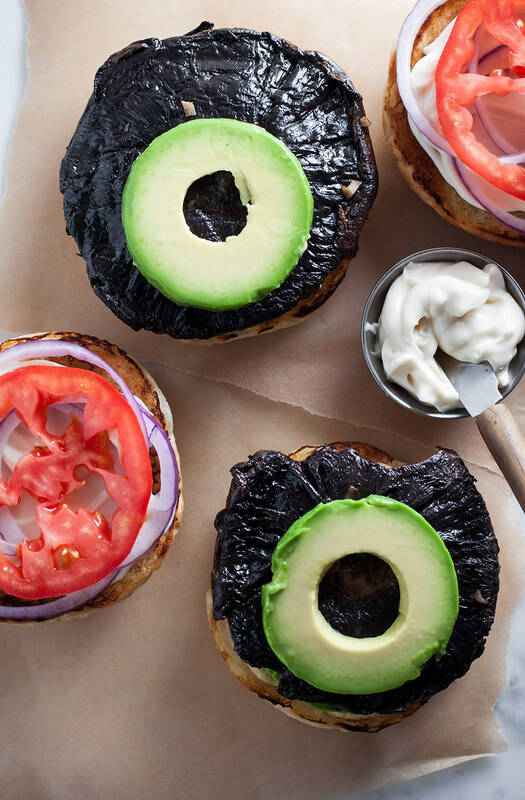 While mushrooms marinate, slice buns and slather each half with a thin coat of mayonnaise, and prepare other burger toppings. Preheat the broiler and move oven rack about 6 inches from it. Toss mushrooms into a bowl and drain the excess marinade, then wipe down the tray with a paper towel or wash and dry it. Wipe garlic off of mushrooms, and place gills facing up on tray. Broil about 5 minutes, then flip over, emptying juice from the gills, and broil about 5 more minutes, until mushrooms are slightly shrunken and tender all the way through. 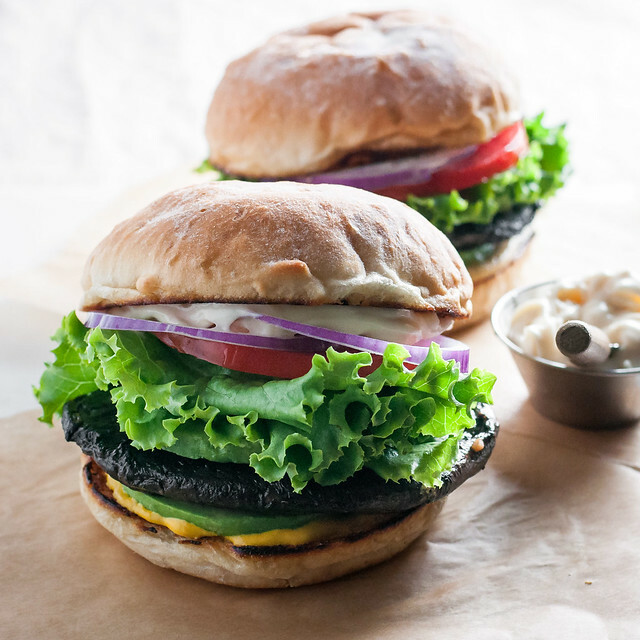 To keep the mushroom burgers from being overly juicy and messy, set them on a plate lined with a few layers of paper towels. Remove paper towels after a couple minutes. While mushrooms cook, toast buns in a dry skillet over medium heat on cut side, a few minutes each, until golden. Set aside or keep warm in the bottom of the oven (away from the broiler element). Build the burgers with your choice of toppings. I liked this order: bottom bun, mustard, avocado, portobello burger, lettuce, tomato, onion, mayo, top bun. Don't try to be neat and tidy while you eat this one. Cutting it in half helps, but it's juicy no matter what. Portobello marinade recipe adapted from Isa Chandra's perfect grilled portobellos. To get round doughnut shapes of avocado: Instead of splitting your avocado lengthwise, cut it crosswise around the fattest part. Remove the pit as you otherwise would, then slice away, peeling each ring individually. Prep time excludes 30 minutes of inactive marinating. Note: This page contains affiliate links. It does NOT contain sponsored content. 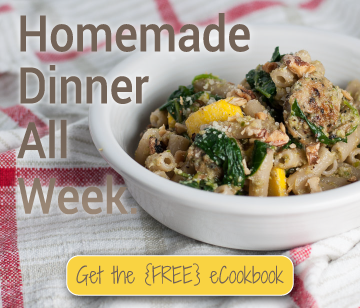 Affiliate links (to products I recommend, on Amazon) offset my ingredient and website maintenance costs, so I can keep bringing you fresh recipes like this one. Thanks!